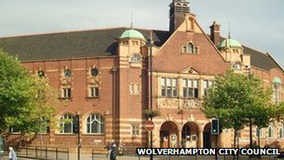 Plans to cut £64m from its budget have been announced by Wolverhampton City Council. The council has tweeted "services will go and jobs" and claimed this was "the most severe financial challenge in the authority's history". The proposals include raising charges to schools for providing meals, reducing library opening hours and closing the central baths. The council has blamed a reduction in central government grants. In September the authority announced that it was planning to cut 1,000 jobs to make savings. It said the move was necessary to avoid a deficit of £89m by 2019. A rise in council tax of 2% next April, the first increase in four years, is "virtually certain", the Labour-controlled authority said. Councillor Andrew Johnson said: "There is just no way we can make these levels of savings without dramatically reducing our spending in terms of the services we provide." Bilston Craft Gallery to be run in "more commercial ways"
The charges the council makes for providing school meals could rise 2.5% in 2014/2015 and 5% over the following three years. Schools will have to decide whether to pass increase on to parents, the council said. Closing libraries early and charging users for internet access could save £1.7m, the authority said, and avoid the total closure of one of its 15 branch libraries. A subsidy of £316,000 to the city's central baths could be ended and it could close completely if the council is unable to find someone to take over its running. The council has published full details of the proposals on its website, with a consultation period beginning next month. The final decision will be made by the full council in March 2014.